Thank you for considering us for your upcoming fundraising event! 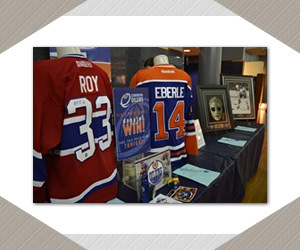 Spectrum Authentics is pleased to help it’s charitable partners by providing our 100% authentic sports and entertainment memorabilia, unique home décor and personal items on consignment, eliminating all risk and investment on the part of the charity. Please go to our Create an Account link to view our catalogue. We are strictly wholesale and only open our catalogue to our charitable and corporate partners. Often, our items are limited and out the door as soon as they are in, so the best way to find out what we have is to sign up with us, follow us on Twitter and request our newsletter! To maximize your fundraising efforts we recommend 100 percent consignment. We will provide you with a list of suggested items for your event. We will base our suggestions on what is currently happening in sports and entertainment, the size of your event and demographics of your group. The final selection is up to you! We will provide you with everything you need to run a successful auction, your volunteers run and manage the auction to maximize your fundraising profit. Our full service auctions come with all the benefits of 100 percent consignment, 100 percent authentic memorabilia, and a customized exclusive auction with the added benefit of being set up and run by our trained staff. Spectrum staff can also customize live auction packages with our partners to assist you with your fundraising goals!